Who doesn’t love fresh flowers all year long? 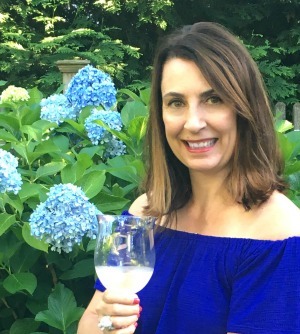 I love cutting flowers from my garden and bringing them inside but did you know that when and where you cut hydrangeas can determine whether or not you’ll get blooms next year! Make sure you read my tips on When to Prune Hydrangeas and what to do if you have Winter Kill Hydrangeas. 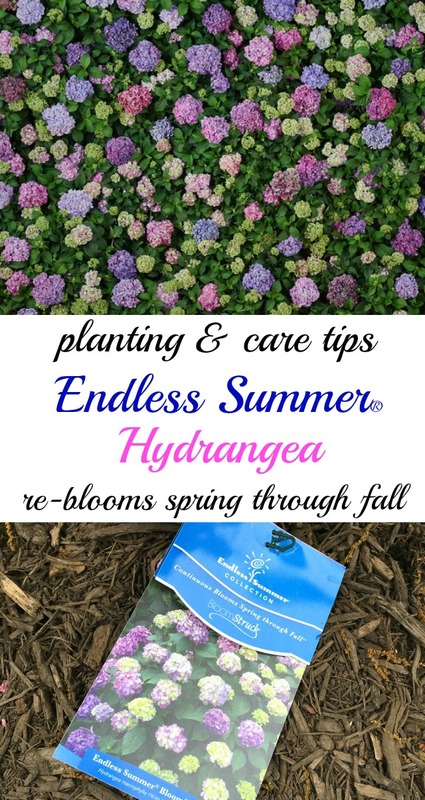 I’ve teamed up once again with Endless Summer® hydrangeas and have been enjoying them all year long and love that they continue to bloom spring through fall unlike regular hydrangeas that bloom only once. What’s a girl to do with all those hydrangeas? Cut them to enjoy inside of course. 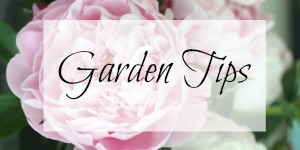 Tip: When cutting blooms for flower arrangements before August, you can cut long stems but when you cut blooms after August 1, it’s important to cut ABOVE any buds. 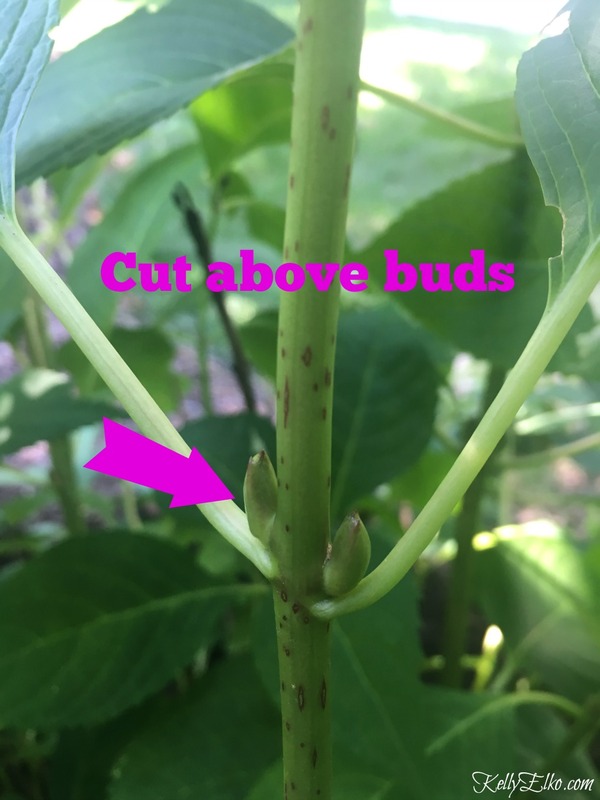 Cut short stems so you don’t risk cutting off developing buds for next year. I love the way my hydrangeas change color throughout the year – from vibrant pinks and blues in mid summer (pictured below) to gorgeous deep shades of rust and greens in fall. I used a shallow vintage bowl to support the short stems. Bonus – I will leave the hydrangeas to dry in this bowl of water. That’s right, just let the water evaporate and you’ll be left with beautiful dried blooms. I love decorating with dried hydrangeas so I can enjoy my favorite flower all year long. Kelly, The ones in the picture are dried? Wow, I didn’t know they looked so pretty when dried. Thanks for a chance to win. Hi Pat – these are freshly cut and aren’t dry yet. I’ll leave them in water until they dry – unfortunately they won’t look this amazing when dry but still pretty! I have had Hydrangea plants in my garden for years and this is the first year that I actually had flowers. Not many, but it is a start . So glad I found your blog on Pinterest with all your helpful tips. Looking forward to more of your posts. Thank you. They are really beautiful Kelly! I planted some Endless Summers myself this summer!! I plan on using them in my Christmas tree! Natures bounty! That will be gorgeous Becky – I’d love you to send me a pic of your tree! i need their tips! our hydrangea didn’t bloom this year… WAAAH!!! or maybe you need to come help me… i can provide plenty of wine! Hydrangeas are such a gorgeous flower; wishing I had some growing in my yard. Great tips you give. Learning something new every day. Will be passing on the cutting tip to friend of mine so Thank U. If I could have my entire backyard lined in hydrangeas I would. So beautiful! I have always loved HYDRAGEAS. My grandmother grew them all over her yard. Each year I plant at least one . I love Hydrangeas they are so beautiful! Thanks for the giveaway! Such a lovely and versatile plant. Love Hydrangeas! I just love hydrangeas! I’ve tried growing them but have been unsuccessful here in S. Texas, my soil and heat is just not a good match. Oh, my Goodness! I never knew this about cutting above the buds! Thank you! Hydrangeas are my favorite flowers! Thanks so much for the chance to win. I love my hydrangeas! Hi, thank you for the opportunity to win. My grandma grew these beautiful flowers and have always been a favorite of mine. Hydrangeas are one of my favorite flowers. I love the different colors and varieties they come in. Consider this my entry to your fantastic giveaway. Maybe if I won these gloves, my hydrangeas would bloom 🙂 !! Love hydrangeas but have not really tried growing them. They have such beautiful colors. These may be the prettiest ones I’ve seen. they looks gorgeous, and thanks for the tip about where to cut. Well this is timely .. I was just yesterday standing in the front yard staring in bewilderment at my huge, leafy hydrangeas …… with NO blooms this year. Last year they bloomed like crazy, I was giving away blooms left & right. Then nothing this year. #perplexed. So I’m grateful for any help! I’ll definitely be signing up for those texts. I love your hydrangeas they are beautiful. I have a big peony plant in my front flower bed, I was hoping to transplant it this fall. When is the best time? I also need to purchase some peony stakes so they don’t flop all over the place. Do you recommend cutting them back in the Fall? I am so new to gardening, I haven’t dared touch them, I have a black thumb :(. I absolute love Hydrangeas and I have about 8 in my yard. Six are doing well; sadly, two look rather unhappy. Thank you for your tips. Maybe I can make my sad ones happy like their other 6 friends. Yes, I do talk to my plants. As a grandmother of 13 I have earned the right to talk to my plants for my gardening therapy. Very informative. 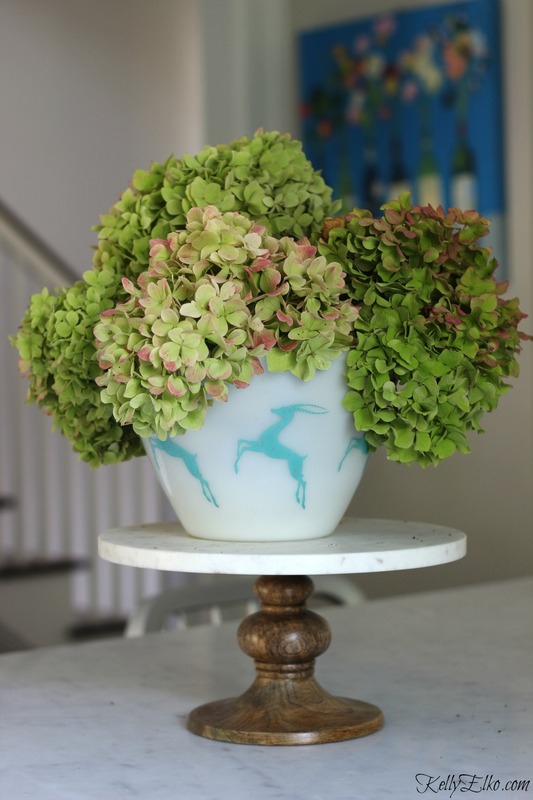 Beautiful deer bowl that you’ve placed the hydrangeas into. Ironic! Those critters ate about one half of my beautiful plants. We missed a spray date (Liquid Fence) and the whole herd must have swooped in during the night. I LOVE reading about your ENDLESS SUMMER tips!!! They are the ONLY ones I have in my yard!!! I have TEN that I started with and I want TEN more next year!!! They have rewarded me beautifully!!! Thanks so much for your wonderful tips!!! Keep those GREAT TIPS COMING!!! Also, “Best Place To Buy” would be great!!! I have bought mine at Lowes but they don;t always have a big selection in my small town!!! THANKS!!! Love you, Kelly!!! Thank you for the great tips! I love hydrangeas!! great advice! Love drying flowers from the garden! Super helpful tips! Thanks so much Miss Kelly! I love the article and I will be purchasing more endless summer hydrangeas! Thanks for the hydrangea tips!! The hydrangeas are so pretty. I am working on a couple of gardening projects this fall. Great tips! And beautiful hydrangeas!! I love dried hydrangeas. I used to have a few plants, but moved and left them behind. This time of year, I always miss them. These are such beautiful flowers. 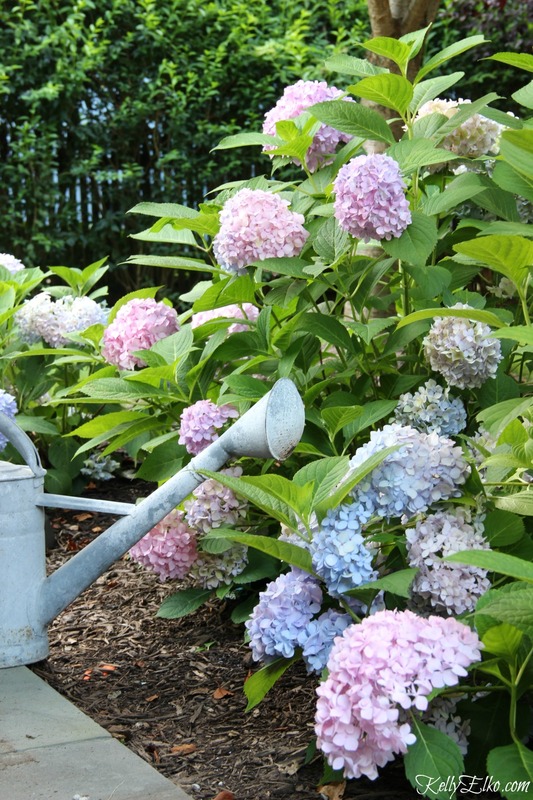 I’ve never tried growing hydrangeas…..perhaps I should! Thanks for the info, especially the photo. My three year old hydrangea hasn’t bloomed yet. So disappointed and I need to do some research. My goal is to have it look as lovely as yours! I’m so happy to learn about Endless Summer Hydrangeas that bloom all summer, even turning colors. Hydrangeas are about my favorite and I would love to plant more in my yard. Thank you for sharing. You are certainly the Queen of Hydrangeas – your blooms are so robust and beautiful! Thanks for sharing your helpful tips. It is amazing how they change color based on soil. Think there is a lesson about people here. These are awesome tips! Thank you! 🙂 One of my favorite flowers! And I love the container , deer Pyrex bowl you have them in! So cute! I’m looking for ideas for my flower beds. They’ve been empty for awhile, but filling them is my next project. I have always loved hydrangeas but live in Florida so they won’t grow here. Many of my plants were damaged in hurricane Irma on Sept. 10. It is back to square one with replanting a few things. I might wait to see if some plants come back. Love your blog and great tips! These are such wonderful tips! Hydrangeas are a favorite of mine, and i love the beautiful array of colors they come in. P.s once you dry the hydrangea’s for decoration you can spray paint them to give them some color/life! At my father’s wedding they spray painted them metallic gold. Beautiful would be an understatement. Hydrangeas are just so beautiful. I love Hydrangeas, just wish I had some in my gardens! Hydrangeas are beautiful flowers! My sister has a bush of hydrangea at her home. She passed away in 2003 The flowers are still blooming without any help! I’ve always loved Hydrangeas — especially the blue ones. I don’t know if we are in the right planting zone for them (Zone 9 or 10). I remember one B&B we stayed in — forget where — but they had an entire yard full of the most beautiful blue Hydrangeas. Thanks for the tip on cutting the hydrangeas, I never cut mine before, but they bloom beautifully. Fabulous! I just cannot keep these gorgeous plants alive. They always die on me. I love and want some, but no success. ????? Beautiful! Thanks for the tips! I love my Endless Summer Hydrangeas! What pretty flowers! hydrangeas were my wedding flowers bc they are amazing! I love hydrangeas . They’re never ending and always changing colors. Just beautiful. Thanks for the opportunity! I didn’t realize that you could dry hydrangeas in a vase like that! I don’t have hydrangeas yet since we just moved and starting from scratch. I am definitely considering getting a hydrangea! So pretty! Every year i add a new hydrangea to our garden, i love them! That’s such a great idea to get text tips. Thank you for the great post and tips! This summer I planted my first two hydrangea bushes and I am hoping to make them thrive and not accidentally kill them. I feel pretty confident after reading this post! I have 15 hydrangea plants throughout my gardens so I can afford to bring them in the house to enjoy and/or dry. 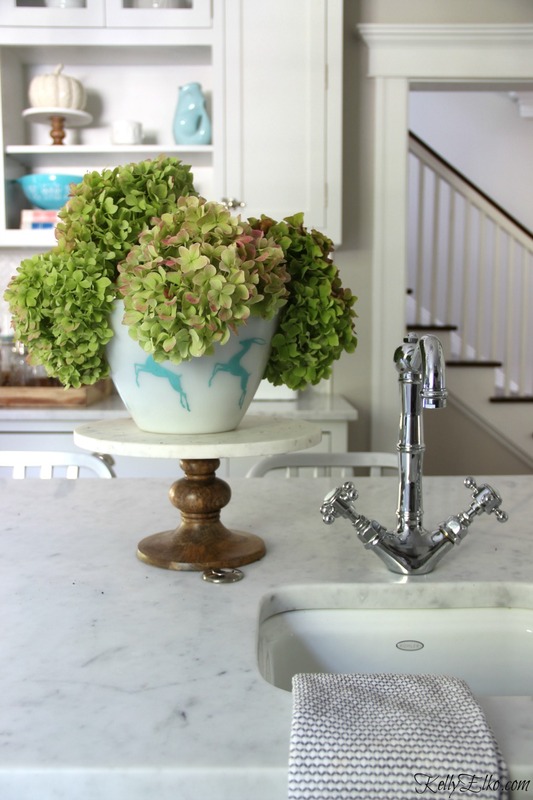 I love your photo of the shallow vintage bowl with the short stem hydrangeas spilling out over the sides. I plan to try that next fall when the gorgeous colors appear change almost everyday. Thanks. Lucky you Cathy! I have over 20 hydrangeas (I lost count) and there is nothing better than bringing some blooms inside!